Oh Joy! It’s the first day of kindergarten! I can still hear the sound of children crying, see the exciting roll of big white paper with crayons invitingly nearby, and feel my hear thumping in my chest. Each new start of a school year always seems to conjure up memories of my very first day of kindergarten. My sister was just born and my mother needed to stay home with her. My father had to open his hardware store in the morning, so I went to school with my mother’s friend Elsie and her daughter Ronnie. Ronnie seemed quite confident and jumped right into some activity that was put out on one of the child-sized tables. Shy Renee stood on the side, wanting to be a big schoolgirl but also wanting to be home in a nice, safe place. That’s pretty much all that I can remember from my first day of school, other than the little boy who wet his pants and had to be taken to the bathroom in the corner of the room to be changed and my father coming to pick me up at the end of our half day of school and jokingly referring to my teacher, Miss Hefferman as “Miss Peppermint!” While his joke is funny in retrospect, at the time I was mortified that he was making fun of my teacher’s name. I think that I was also so afraid that she might hear my father’s blasphemy! These memories are as fresh as though they happened yesterday and not (could it really be?) 64 years ago. I can’t say if my first day was a good experience or a frightening experience. Mainly, I know that it was important enough to be memorable. Years later, when I became a kindergarten teacher, I knew that it was important for the first days of school to set the tone for the year. I wanted all of the children, the outgoing, confident ones and the shy, quiet ones, to leave school excited and enthusiastically eager to return the next day. I’m not sure if this always worked for each child, but that was my big goal. I knew that establishing routines was important but that would happen as children began to understand the flow of the school day. Getting children to learn how to follow routines was most definitely never my primary focus for these first days of the school year. Setting the stage for each child’s love of school was my personal mandate. I made sure to create a room that would be welcoming, comfortable and interesting. For instance, I had Peter the turtle, named by a class, many years ago, after a character in their favorite book, A Snowy Day. One year I had the offer of a used 55-gallon tank, which I accepted. Although it took up a lot of precious classroom space, I had an instinct that this turtle would be an important member of the class and I was right. Throughout the year, children chose to write stories, non-fiction books and poems about Peter. I set up the tank right near the entrance to the classroom. Children and parents started the first day by greeting me at the doorway and then greeting Peter! At the other side of the tank was the carpet where we would have our class meetings. Often, to the giggling joy of the children, Peter would climb up on his rock and seem to listen to our singing and enjoy our stories. So, what actually happened in my kindergarten classroom on the first day of school after the photo-snapping parents and grandparents left their most wonderful treasures in my care? I set up activities on the tables for the children to explore. For example, in the art area I might have had a vase full of sunflowers, art postcards with flower reproductions for children to look at, paper of different sizes, crayons and colored pencils. The dramatic play center was open, but on the first few days I only included a small amount of dress-up clothes, play dishes and pots, a play telephone and a small pad with pencil. In the near future, as the children became more skilled at cleaning up, I would add more materials to the center. I put out some simple puzzles that would be inviting but not overwhelming and some manipulatives such as a pegboard and a magnet-builder. The block center was closed (blocks covered with a sheet or paper) on the first few days. Very soon I would introduce the unit blocks to the entire class through a whole class building activity. When all of the parents left, I was free to walk around, chat with the children and record my initial observations. How did children approach and use the materials that I put out for them? Who jumped into an activity and who stood on the side and needed my help to join a group or find an activity? Clean up time, too, was informative for me. In looking through my scribbled notes in some of my old plan books, I see that some years I wrote, next to clean-up time, “good job by class” or “Tommy might need special help learning to do this” or “leave more time for clean-up.” These initial observations gave me the information I needed to guide me in planning appropriate lessons for helping children learn clean-up procedures and also for helping children learn to transition from one activity to another. When we all met on the rug the first day, I shared the year’s first morning message. Because it was a short school day, I didn’t plan a separate snack time. The children had a snack on the rug as I read them a storybook. One year it was Mooncake. 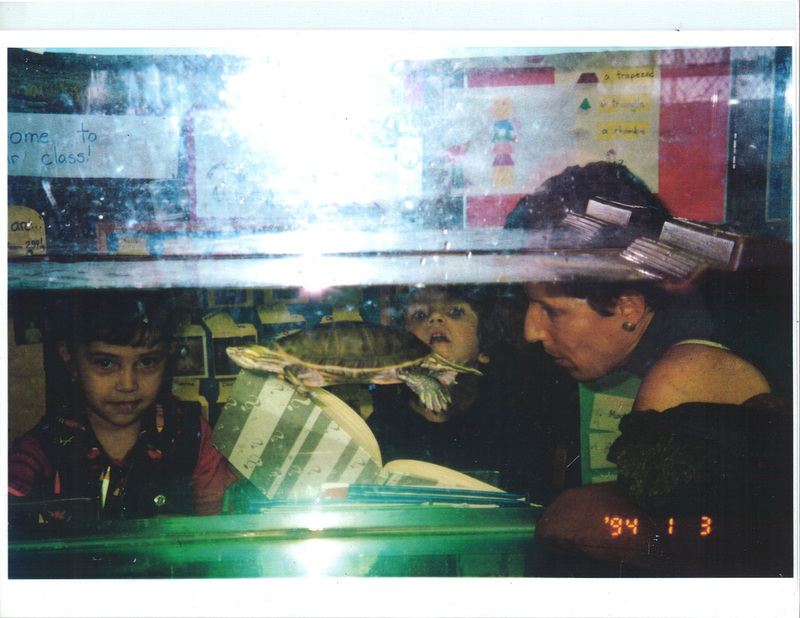 Another year I read Franklin in the Dark, which turned out to be very popular with the children, perhaps because of the turtle in the room. I usually taught the children two songs the first week of school. I wanted them to sing songs that they could bring home and sing to their families. It wasn’t the same two songs each year, but two popular ones were Woody Guthrie’s “Howdi Do” which we sang throughout the year at the start of the day, and “Freight Train“, a very calming song that we often sang after lunch and at the end of the day. In each case I eliminated verses or even changed some to make them more appropriate for 4 and 5 year olds. I might, if time permitted, teach the game Statues or Mirror (Face-to-Face). I did, however, try to keep the time that children sat on the carpet as short as possible. At the end of the morning, the children drew self-portraits. (Sometimes I saved this activity for the second or third day of school.) I gave each child an individual mirror and a paper with the child’s name. As one would expect with 4 and 5 year olds, there was always a wide range of drawing abilities. Some children made noticeably realistic drawings and some children were happy with squiggle sketches. I celebrated all of them. We would create self-portraits at the start of each month. By the end of the year these drawings became wonderful assessments for the children and for me. The first day or two were usually half days that tended to be over sooner than I always expected. The morning would end with our new song and with some description on my part of something exciting that would happen the next day. I know that my synopsis of the start of the school year is rather sketchy. However, the big idea that I would like to emphasize is how important it is to think of these opening days of the kindergarten year as a special time when teachers can begin to generate children’s enthusiasm and joyful love of school. This is the excitement that teachers can build on throughout the school year! Howjido, howjido, howjido, sir, Doodle doosie, howjido. Freight train, freight train going so fast. Love to hear that old whistle blow. Makes me feel like I’d like to ride some, too. This entry was posted in Investigating Choice Time: Inquiry, Exploration, and Play on August 19, 2013 by Renee. Renee – your wonderful, insightful reflections will provide a pre-read for students in two of my undergraduate classes. In my Projects and Play class, your reflections will get them excited and curious about their new adventure of working and learning in Pre K Head Start classrooms this semester. In my senior Teacher as Researcher classes your recent posts will provide a model for reflective writing as they start their student teaching and look back on their lives as reflective and deliberate beginning educators. Thank-you for the inspiration!! You have captured those first day feelings so well you make me want to write about them!! In fact, I woke up this morning thinking about how I had to get back to my blog. I unintentionally took the summer off with so much going on…and what a treat to wake to yours! Perhaps I will begin writing about some or one of my “first days”! And I leave this post with the hope that all kindergarteners will arrive with great hope, excitement and that they will have someone like you to greet them! And Peter too! Renee — thank you for this lovely description of your opening day. I think what appeals to me is that the children are allowed to explore things right away rather than being expected to sit still and be quiet before they are even accustomed to being there. I had a preschool teacher who did that – and it was so effective. The children might be afraid of leaving mom or whoever, but immediately were attracted by what was offered in the room. And they had choices. And of course I love the songs that you sang and the books that you read. As I think I told you my granddaughter’s kindergarten experience lacked blocks, toys, dress-up clothes, real play time, painting, clay, etc. They sat at tables in little groups around boxes of pencils, crayons and scissors and did a lot of pencil and paper work. It was truly awful. But if I were a new teacher starting now I’d want to teach kindergarten – and resist testing in any way that I could. I love your vision of early childhood education more I can say, and feel a bit wrecked that my daughter, who started K in NYC today, is going to have such a different experience. When picked the school in part because we were promised something at least somewhat like what you describe, and what I got instead was a classroom with several behavioral management messages posted on the wall (a red/green/yellow chart, a song about proper hallway behavior, a big sign about being quiet/looking at teacher/listening/sitting still), a well-meaning but really misattuned activity for parents and children to do together, and a lot of literacy materials. I guess I should be grateful that there was an imaginary play corner — when I toured schools I saw kindergartens without such a play space. But I had hoped for much more! The teachers (we are fortunate to have two of them) seemed like lovely young women, clearly very enthusiatic and warm, and the both have studied early childhood education at reputable schools. And yet the classroom offered none of the sense of wonder and pleasure of the classroom you describe creating, Ms. Dinnerstein. I am at a loss as to how to influence things. We have been told that parental input/feedback is most welcome by the school, and I know we are expected to be very involved in the school and supporting it. i dont want to be unfair, and I know K teachers confront all kinds of constraints and pressuring expectations, but I had hoped this school I chose, and felt lucky to get into, would find a way to be different, and I’m quite disappointed. I want to give these relatively new teachers (five and three years experience) the fullest respect for the professionals that they are. But what I really want is for them to read this blog and pretty significantly change their approach! I feel for you AND for the two teachers. They are probably getting some strong dictates from the administration and perhaps also from more senior teachers on the grade. Perhaps you could suggest that they and the principal read the blog and also suggest that parents in the class read it. Then at the Fall curriculum conference, you might try, without being confrontational (and, from your note, you sound like a wonderfully understanding and supportive parent who would never be confrontational) to discuss one or two issues. Maybe ask to see the flow of the day schedule and find out if Choice Time is given a priority time during the day. Be clear that you aren’t referring to Literacy Centers! I think that the important thing is to gently make suggestions. Teachers ARE under so much pressure these days. Also, unfortunately, young teachers probably don’t have much personal experience with having an early childhood experience that included inquiry and exploration. I hope that sharing the blog might help in some way. We always seem to remember our ‘firsts’ and first times, and this is why the first days of school are so important for any grade, but especially for kindergarten. What’s interesting to me is not that you recall your first day of kindergarten, what’s interesting is what you’ve held on to for so long – you don’t remember the routines of the classroom but the feelings you had in the experience. You remember key people, your teacher, the boy who wet his pants, your dad and his joke. Your memory reminds us how important it is – in those first days of school – to to elevate relationships and community and to create a classroom that emphasizes invitations more than procedures. This holds true even for our son heading to middle school for the first time. The firsts in our lives matter and the memories linger. Thank you, Renee!